Peter (husband and geologist) and I visited Oahu recently for a wedding. We were reminded of our time in Brisbane with poincianas, tulip trees, frangipanis, assorted figs and palms, gingers, cordylines and other sub-tropical beauties filling gardens and lining broad sun-soaked streets. Whether cultivated or in the wild, botanical success or failure is determined by local geology and climate. With its tropical warmth, moist clean air and rich volcanic soils any plant can thrive in Hawaii. It’s easy to see why Hawaii is often referred to as Nature’s greenhouse. The Hawaiian Islands are located at the margin of the tropics where they are exposed to persistent Northeast Trade Winds. These bathe them in warm moisture enabling an amazingly diverse array of ecosystems from deserts to rainforests to exist within relatively short distances of each other. Before sharing some botanical wonders with you, I’d like to explain briefly Hawaii’s unique geography and geology. Being almost 4,000 kms away from its nearest neighbours (Polynesian Islands and North America), Hawaii is the most isolated land mass on earth. 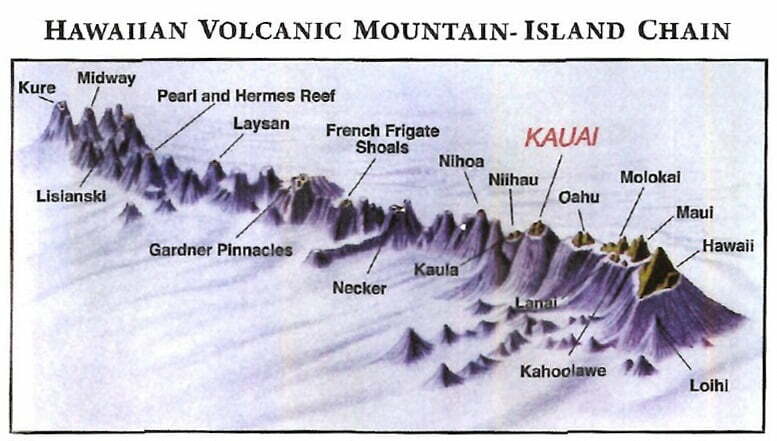 The Hawaiian Mountain Island Chain spans 2,500 kms of the Pacific Ocean. Most of its 107 shield volcanoes are underwater and the visible parts (only 1.5 per cent of the total volume) consist of eight high islands and numerous smaller islands, reefs and shoals. The eight main islands account for 99 per cent of Hawaii’s land mass and are clustered together over a mere 500 kms. It’s taken 30 million years to form this topographic sequence which is the first part of the longest mountain range on earth – the Emperor-Hawaiian Volcano Chain. This archipelago spans 6,110 kms and tells the story of 80 million years of geological evolution – starting at Hawaii in the middle of the Pacific Ocean and extending northwest almost to Kamchatka in Russia. The youngest island in the whole chain is Hawaii’s Big Island (also confusingly called Hawaii) which sits on a hotspot. 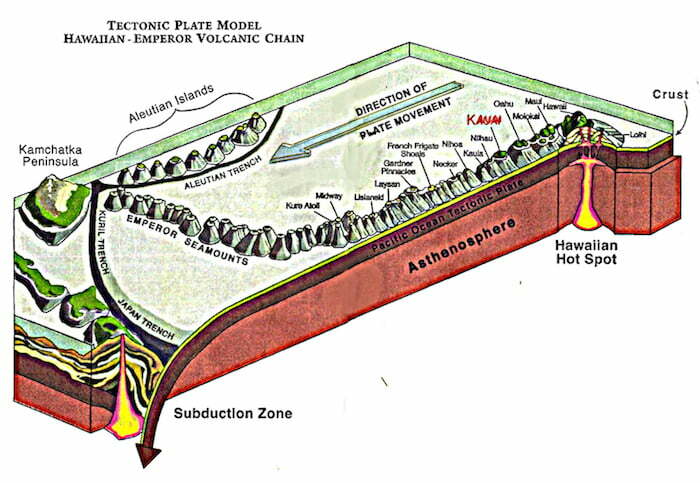 I think of a hot spot as a slowly and continuously erupting ‘geo-abscess’ of hot molten magma exuding mineral rich lava onto the earth’s surface – forming volcanoes above and below sea level. Hawaii’s most active volcano, Kilauea, is presently above the hotspot and is only 200,000 years old. It’s a low-sloped shield volcano and has been in the news lately as eruptions are occurring out of fissures along its sides. 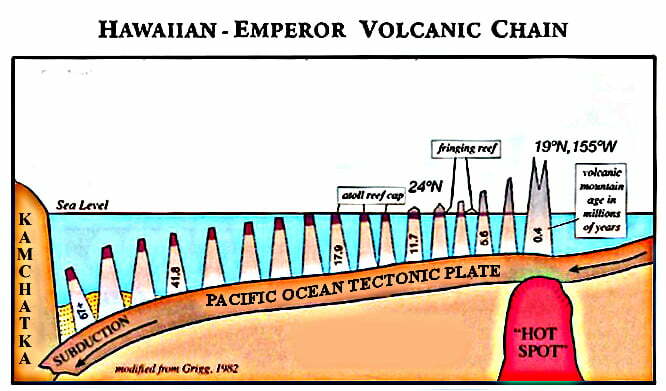 The Hawaiian Hot Spot stays relatively still but the Pacific Ocean Tectonic Plate (a giant slab of the earth’s outer shell) moves across it in a northwest direction and a chain of gigantic shield volcanoes is created. As these peaks move off the hotspot they become dormant and, as they get older and older, they weather and erode until they submerge and ultimately get consumed by subduction processes beneath Kamchatka. In other words, in the Hawaiian-Emperor Volcanic Chain we see snapshots in time of 80 million years of evolution. We see how volcanic mountains complete their cycle: from birth (in the middle of the Pacific Ocean), to maturity (taking about a million years to reach peaks of 3 kms above sea level) then death (by reabsorption into the planet at the Kuril and Aleutian oceanic subduction trenches). 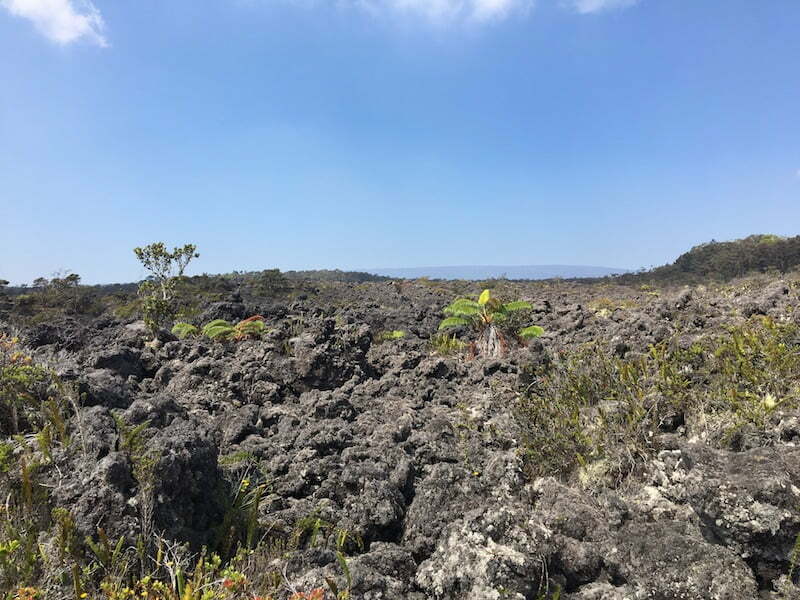 After the wedding we visited Big Island and Kauai on opposite sides of Oahu to experience the breadth of geological and botanical wonders – from barren lava fields to lush forests. 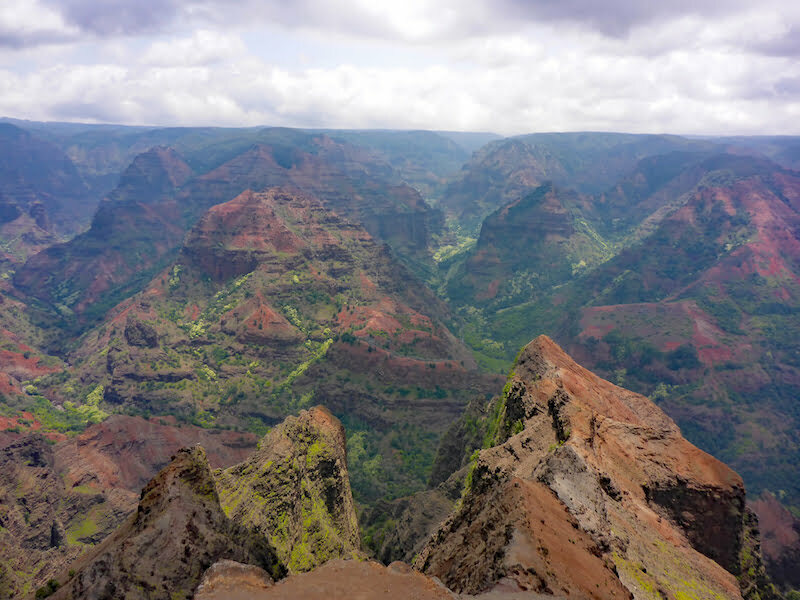 By visiting the first (Big Island) and fourth (Kauai) islands in the chain the ecotourist can observe the birth-to-maturity phases of this evolutionary cycle. 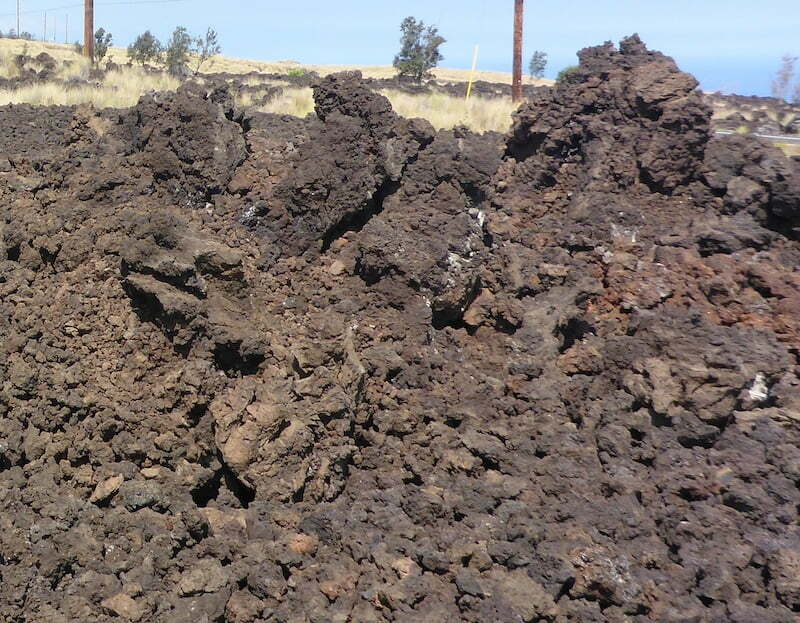 It’s as though Big Island is a gigantic new born baby with geologically young smooth features. When Kauai was located where the Big Island is now, some 4-5 million years ago, it too would have looked like Big Island. Since then it has structurally faulted and folded, weathered and sculpted. With its deeply wrinkled erosional landforms Kauai is the Old Man of the Sea and covered in a plethora of botanical species. It’s easy to see why we refer to Kauai today as the Garden Island. The Big Island reminded both Peter and me of our visit to Iceland. As we drove across the island from Kona to Hilo we loved seeing again the expansive lava fields and distant volcanic mountains that originally produced these basaltic flows. Geologists around the world use the Hawaiian words Pahoehoe or Aa to describe the two main larval formations. 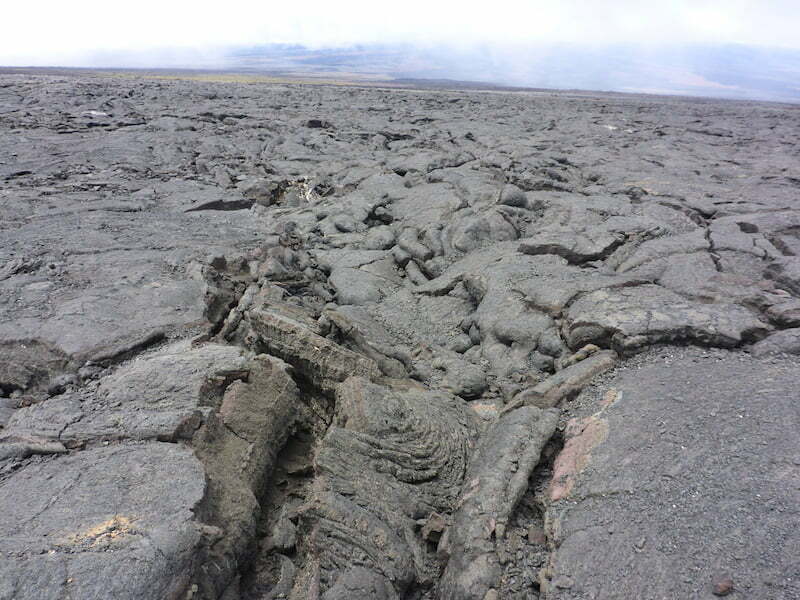 Pahoehoe tends to be smooth and looks like folded cloth or coiled rope while Aa is ragged and looks like bulldozed rubble. I was fascinated by the early colonisers. Hardy lichens come first followed by ferns and small shrubs. Windblown seeds grow in dust-filled pockets created by rain breaking down the rich basalt. Other plants eventually become conspicuous. Vaccinium reticulatum, the Hawaiian blueberry. Ohelo ‘ai is its Hawaiian name. Metrosideros polymorpha is the most widespread native tree in Hawaii. Its name means ‘many-form hardwood’ and it readily adapts to all ecosystems seeding readily and flowering even when only a few inches high. Its wood is hard and evenly textured and is used for flooring, fenceposts and fuel. It’s often the first shrub to appear on lava flows and its trees dominate rainforest canopies. 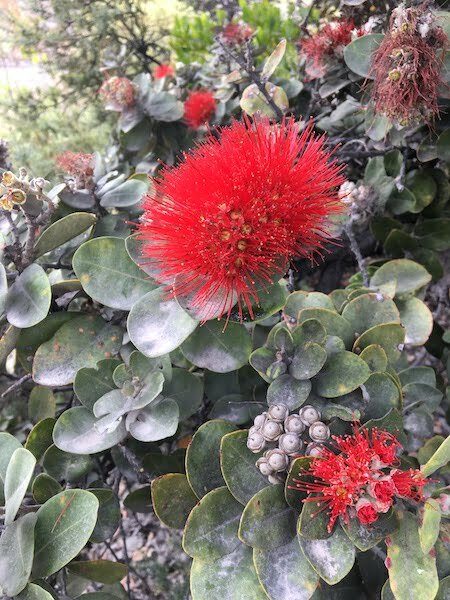 Metrosideros belongs to the myrtle family Myrtaceae and this genus, made up of approximately 60 species, is mostly found in the Pacific region. 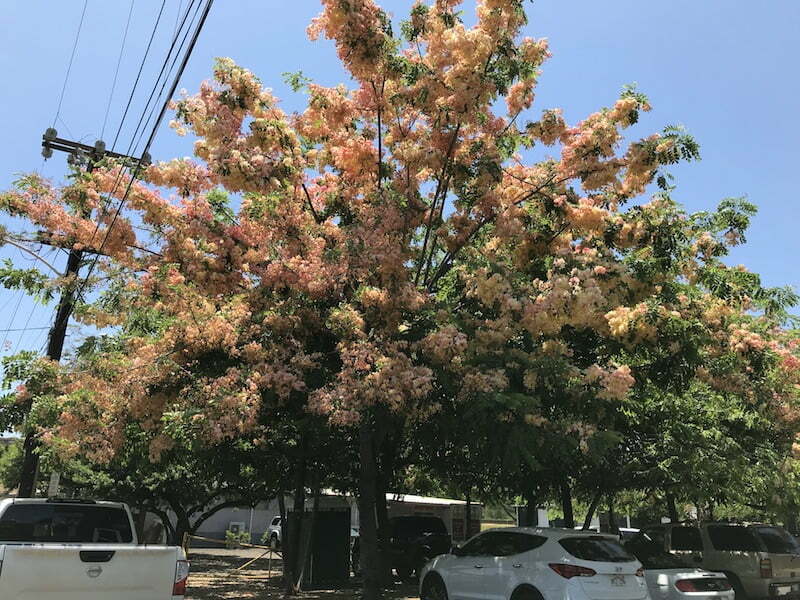 They generally have grey/green, leathery leaves and spectacular crimson-stamened flower clusters earning them ‘Christmas bush’ in their common name. 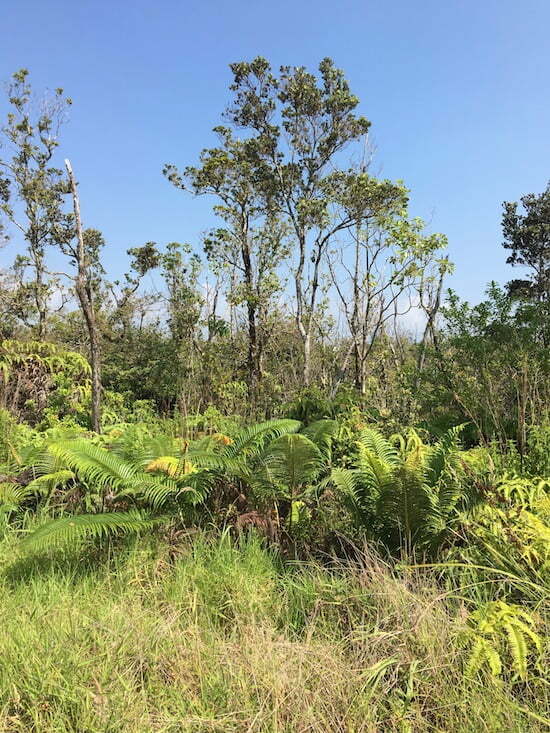 On a drive across the Big Island the observant ecotourist can see plant succession in all its stages. I snapped this photo of some young Metrosideros polymorpha with the native tree fern Sadliera cyantheiodes behind some Polypodium pellucidum ferns, lichens and small shrubs of the Hawaiian blueberry. 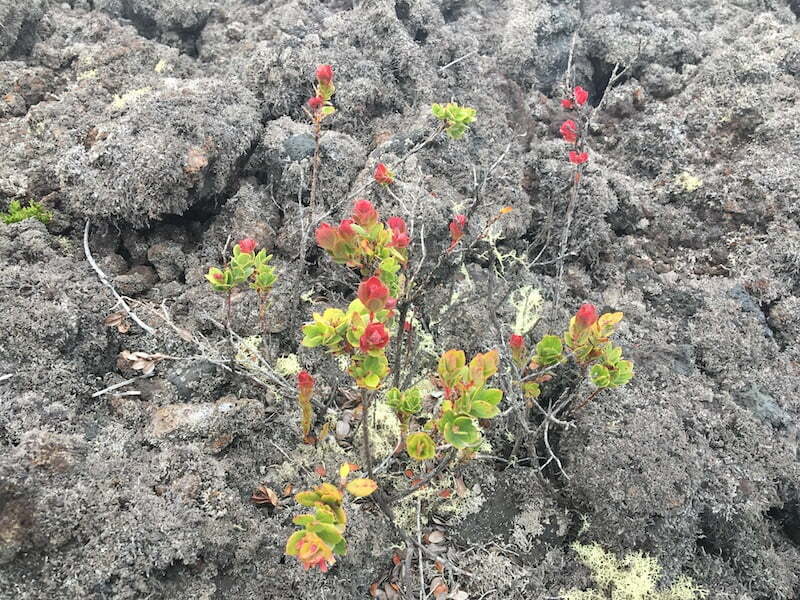 Plants colonise Aa lava flows which, in time, become open woodlands and forests. Open woodland on old lava flows. 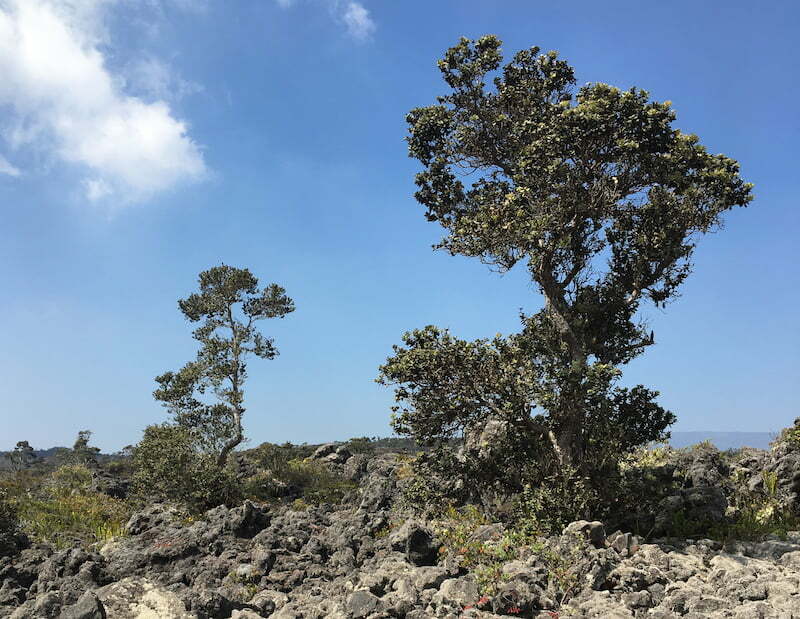 And, like a fast-forwarded movie, it’s not long before you come across well-established open forests in areas where the lava flows are older. If you drive to higher altitudes (along the Saddle Road, in our case) more and more native species dominate the landscape. The leeward slopes of Mauna Kea, the second highest shield volcano on the island, support the best remaining example of mamane-naio forest. 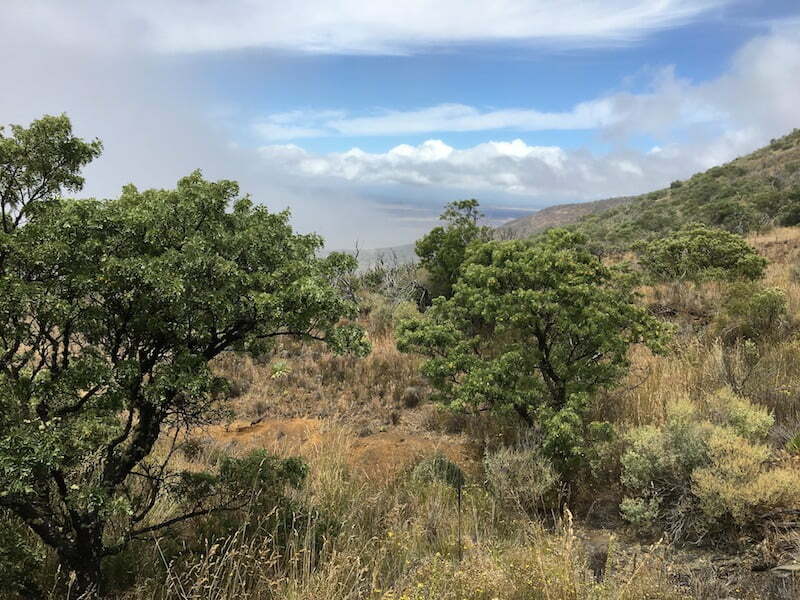 This open scrubland and forest habitat type is named after the Hawaiian names for Sophora chrysophylla and Myoporum sandwicense, the two dominant tree types. Common native forest birds and the endangered Palila (a little Hawaiian finch found here and nowhere else in the world) feed on the green ridged seedpods of the Sophora. 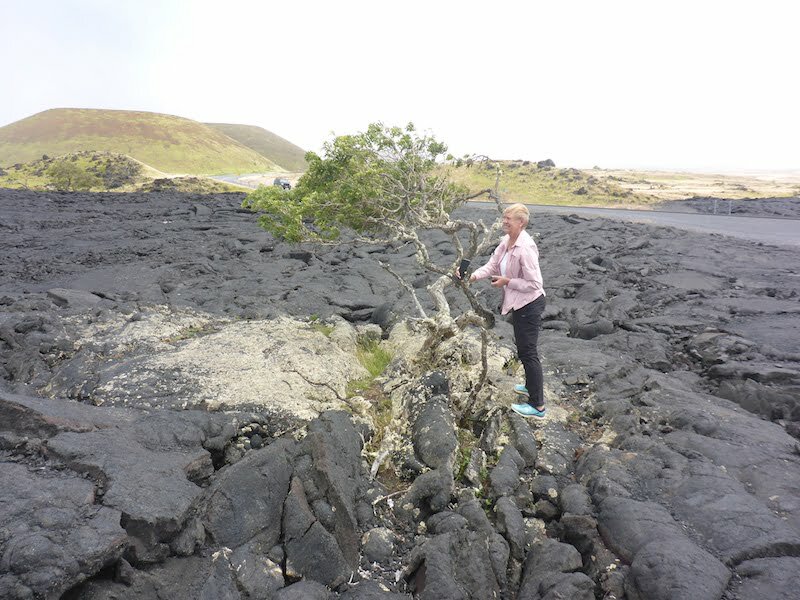 What a treat it was finding this isolated Sophora chrysophylla tree offering watershed protection to other pioneer plants on new Pahoehoe lava flows. This amazing plant is the descendent of an early colonising Californian tarweed (a sticky hairy daisy) that somehow arrived somewhere on these islands 5-8 million years ago. Here it survived, spread and evolved into three distinct plant groups (Argyroxiphium, Dubautia and Wilkesia). Plants that evolve this way and are found nowhere else in the world are called endemic. 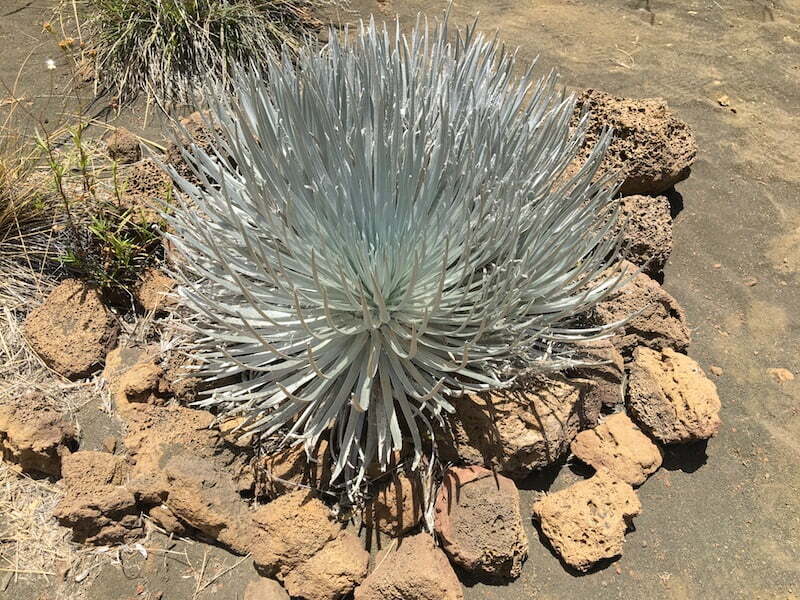 Individual plants that occurred here and in Maui’s extremely harsh sub-alpine environments eventually evolved into silverswords. Despite freezing nights and blisteringly hot days these Hawaiian endemics thrived in isolation and adapted to new selection pressures. Because they had no competition or predators they lost the resin that their American relatives had that would make them forever unpalatable to herbivores. So since 1790s, when Europeans settled in this area, livestock have grazed on this spartan landscape, feeding mainly on silverswords. With the added selection pressure of human collection and other introduced pests, the wild populations of this hardy, once-prolific plant, are now restricted to inaccessible cliffs. Fortunately, while we may be responsible for its demise there are global efforts underway to systematically research, propagate and reintroduce silverswords in the wild and hopefully bring them back from the brink of extinction. And now, to the closest we got to the volcanic action of Kilauea. 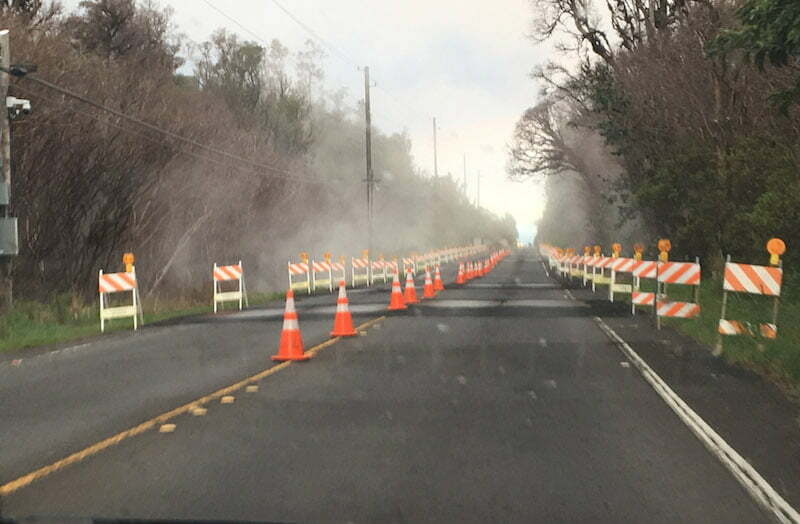 Sadly, the Volcano National Park is currently closed to visitors though it is still possible to drive through it without stopping. It’s not closed because of volcanic eruptions as these are occurring through lateral fissures about 60 kms away. 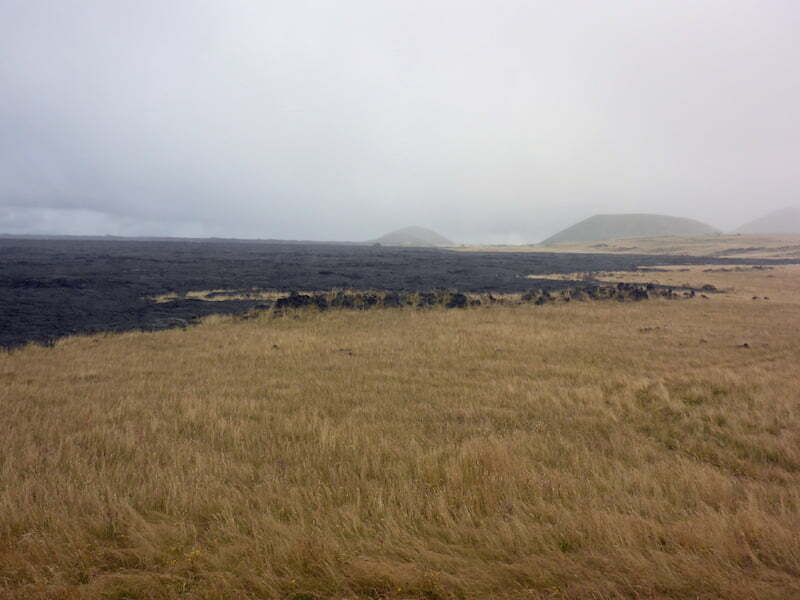 It’s because of earthquakes and subsidence around the rim of the Kilauea crater that this release in pressure causes. The roads are empty and it was a cheap thrill seeing signs saying ‘CAUTION Fault Zone, watch for cracks in road’ and then seeing some. We stayed in the small township of Volcano which is suffering badly from a fall in tourism. Being only 6 kms from the crater we felt the occasional earth tremor. 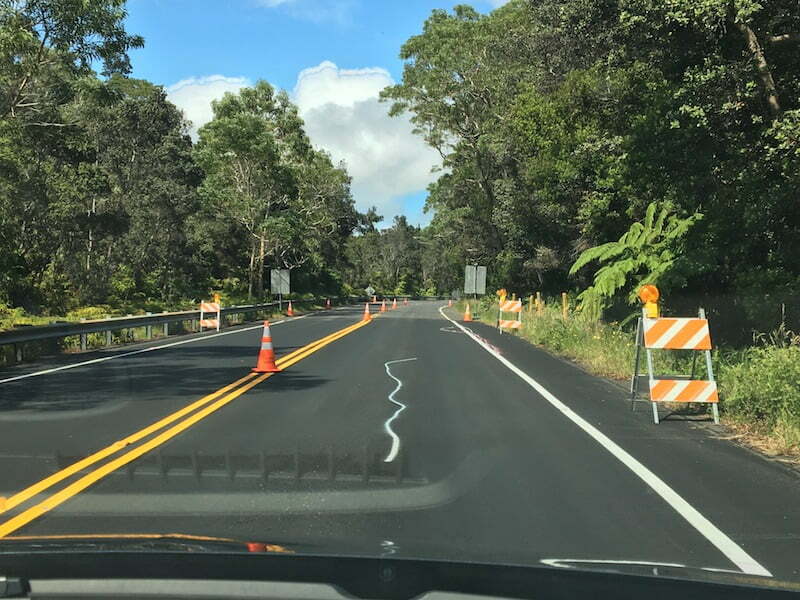 And of course, we went for an evening drive along Highway 130 to Kalapana to see how close we could safely and legally get to the Fissure 8 action. 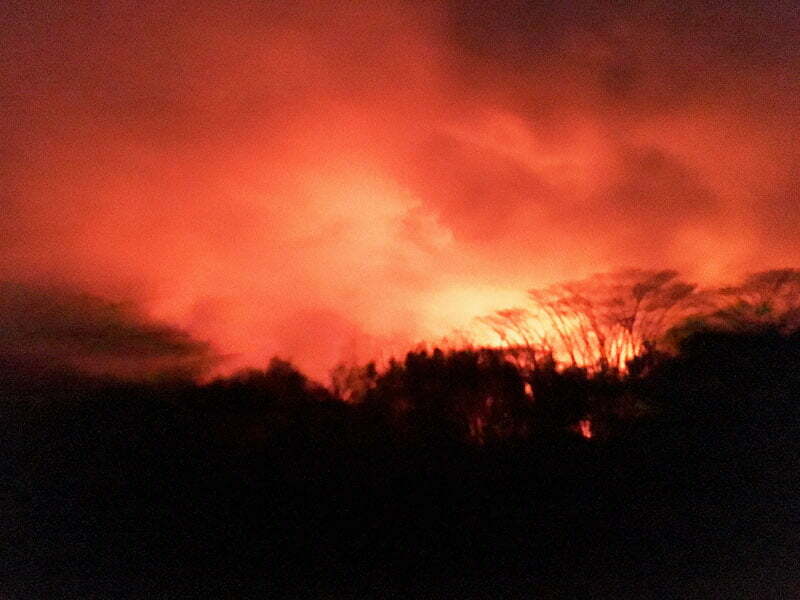 The evening sky glowed red in the direction of the active lava flows. The Volcano Village area is fascinating botanically. 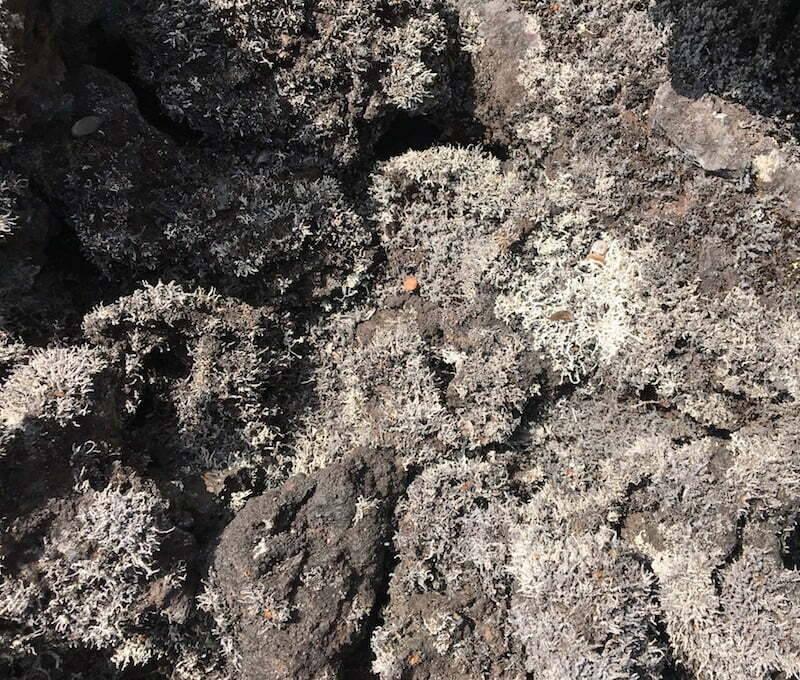 It contains remnant pockets of a montane tropical rainforest that grew in a bed of volcanic ash that fell from the Kilauea Volcano summit during the 18th century. 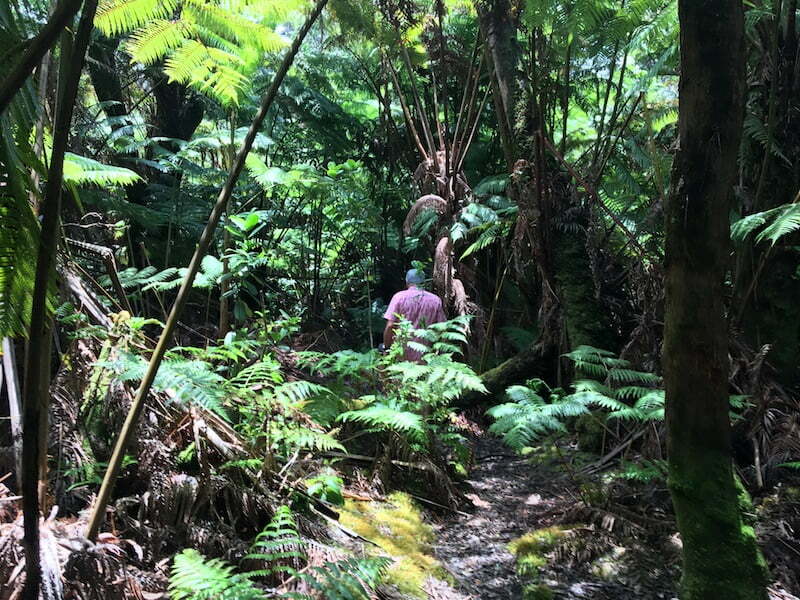 This ohi’a-koa forest is dominated by Metrosideros polymorpha and Acacia koa trees with a distinct understory of tree ferns. Epiphytes clothe the trunks and there is a rich array of ferns and other native species and a thickly littered forest floor. The best example is the Niaulani Forest, a 4-acre parcel of land behind the non-profit Volcano Art Centre. This is a rare old-growth forest with trees at least 200 years old and over 20 metres tall. It has a native forest trail which has been enhanced with many native species and provides a rich backdrop for the centre’s many art and environmental education programs. From our accommodation in Volcano we could see elements of secondary growth forests of this type struggling to survive in wall-to-wall weeds. 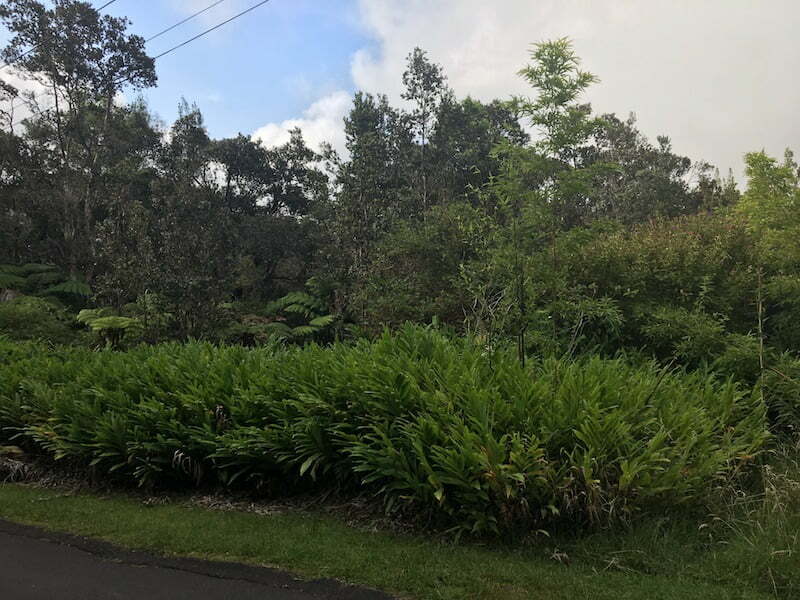 It was depressing to see Ohia and Koa trees and tree ferns being choked by ginger, tibouchina and bamboo. Along Wright Road, off Mamalahoa Hwy Volcano. These tree ferns surround a cave entrance to lava tubes. But how did life begin here on remote land masses that practically popped up in the middle of the vast Pacific Ocean? Over millions of years – and that’s the time span needed because these are extremely rare events – founding species were carried by birds, high-altitude winds and ocean currents, across thousands of miles of open oceans to settle on existing islands. If they survived and reproduced in this isolation they became indigenous. As they evolved into new species they earnt the title of endemics. 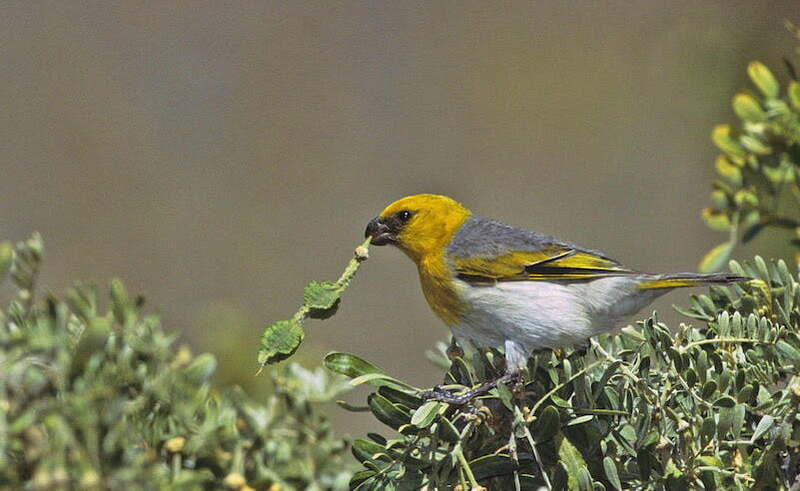 Over 10,000 endemic species of land animals and plants have been identified in Hawaii. 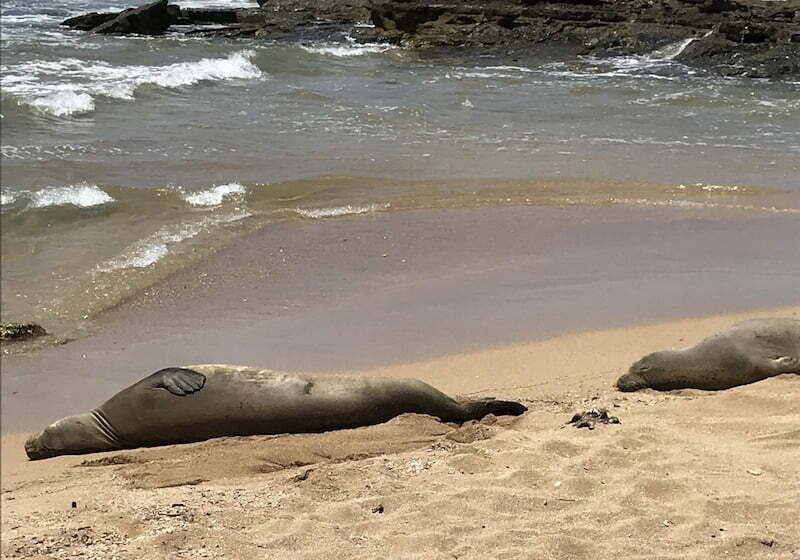 The only known endemic mammals are a single bat species and the monk seal (which spend some time on land). And when did humans arrive? The Hawaiian Islands are one of the last places on Earth to be inhabited by humans. Their exact arrival date is unknown but it’s generally accepted that Polynesians arrived about 1,500 years ago and became the first settlers. They brought provisions such as bananas, coconut, sugarcane, chickens, pigs, dogs and taro with them and farming and cultivation were key factors in their successful colonisation. Some of the exotic plants they brought with them became so well-established in the wild that they are now referred to as naturalised species. 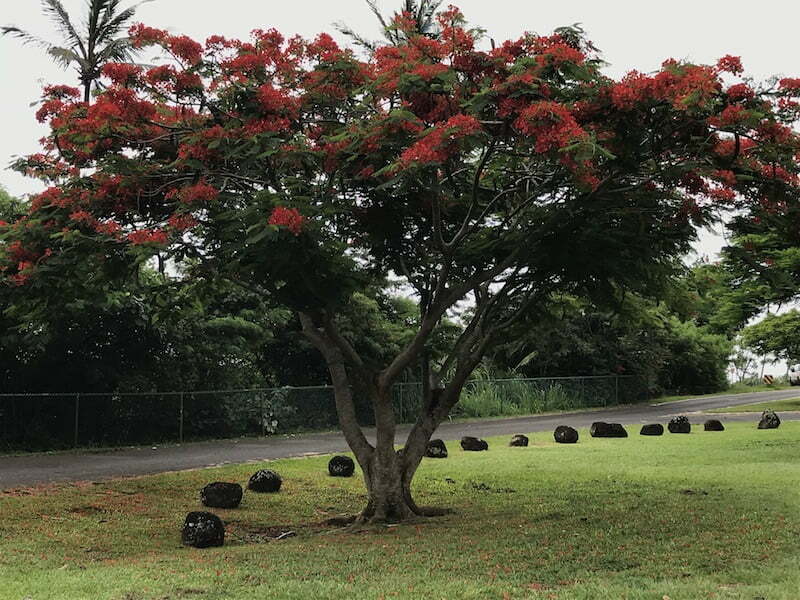 The best example is the candle nut tree (Aleurites mollucana) which Polynesians brought to Hawaii to use the oil-rich nuts for lighting and a myriad of other purposes. This flowering tree was so readily spread around the tropics by early humans that its precise origins are unknown. The pale foliage of candle nut trees makes them easy to pick out in urban and wilderness areas. 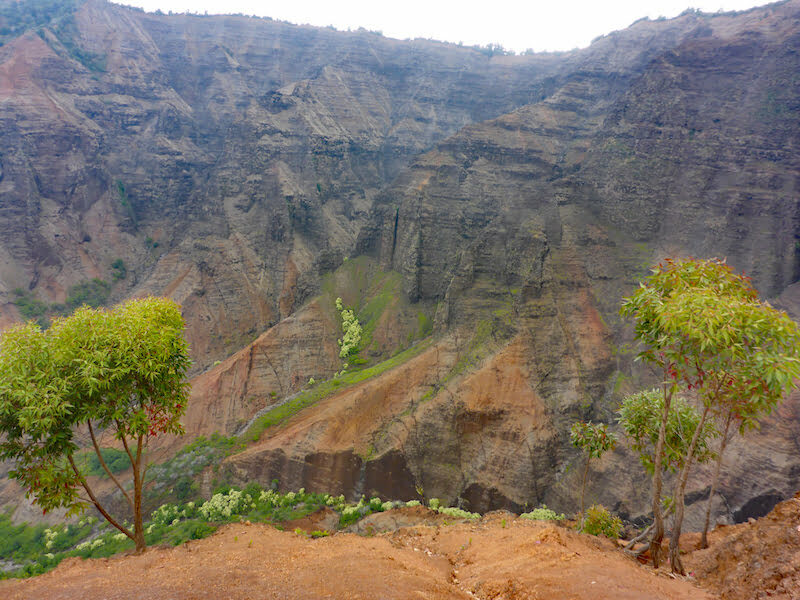 They are conspicuous in the gorges of Waimea Canyon on Kauai and we also found many other Australian natives such as eucalypts, silky oaks and acacias. 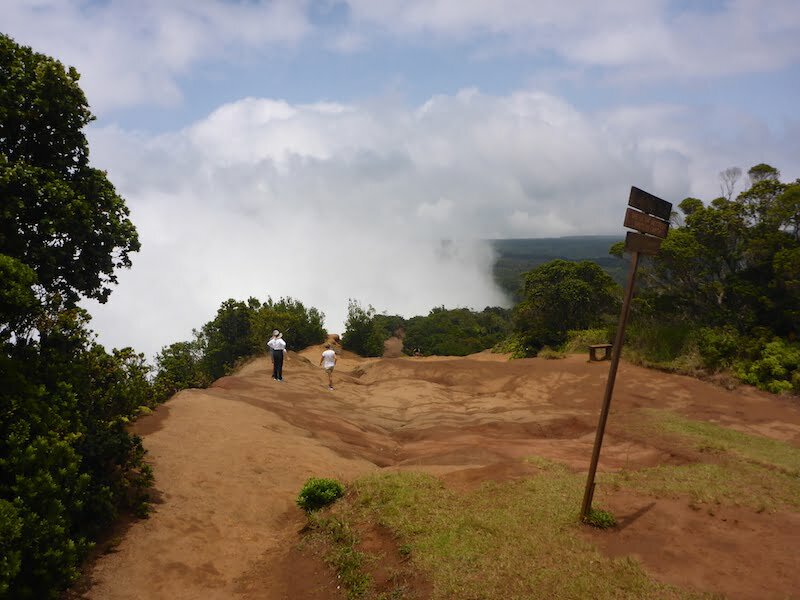 A sign at the Pu’u o Kila Lookout says: Kauai is one of the wettest places on Earth. From these huge 1 km high cliffs on the western escarpment of Waimea Canyon it’s easy to see how the winds are forced upwards and heavy rains fall from the cooling air onto the lush forests below. And underfoot at the start of the Pihea Trail in Na Pali Kona Forest Reserve you can clearly see the effects of constant physical and chemical weathering of the relatively unstable volcanic rocks by atmospheric oxygen and water molecules (and by plant roots and their bioacids). And with a little imagination you can picture how Kauai, now one of the most beautiful islands on Earth, will be transformed into coral atolls, preferred mainly by sea birds, in something like 2-3 million years. In the interim, we make the most of our positive and negative impact on Hawaii’s habitable islands. Thank you for such a fascinating article about Hawaii and sharing your adventure! Great read and top information. Really interesting geology of the area, as well as the rest. So many things to learn……. Thanks, Jennifer & Libby. I appreciate your feedback. What an enlightening article. Thank you so much for putting this together. I now have a better understanding of the geology of the region, which I find fascinating. Describing areas in terms of geological and botanical timeframes certainly puts things in perspective. Thanks, Mark. I’m pleased you found the geological and botanical interactions interesting. I hope you’ll find my next article on the human impact on Hawaii – over a much shorter time frame – equally as enlightening.